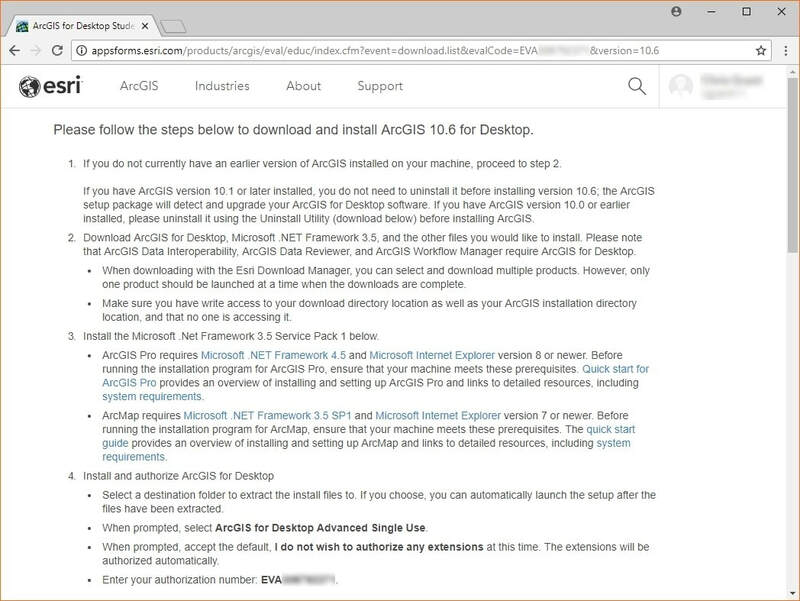 To obtain, install, and activate your 1-year student trial edition of ArcGIS 10.6.1 for Desktop, follow these instructions. ​1. Obtain a student license authorization number from your instructor. The format of the authorization number is the letters EVA, followed by 9 digits. (e.g. EVA123456789). 2. Visit https://www.esri.com/StudentEdition to begin the installation process. You should see a screen that looks like this. You will need to have an existing Esri Global Account, or create a new account (it’s free). Use the link on the right hand side of this page that is appropriate to your situation. ​3. Activate the authorization number (starts with EVA). The screen looks like this. ​4. Choose the version of ArcGIS that you want to install. Select ArcGIS 10.6.1 and ArcGIS Pro 2.1 from the screen that looks like this. 5. The next screen you should see has instructions for what to do next, and includes a number of links that you can use to download the software onto your computer. The instructions are on the screen shot below. Follow the instructions that are shown. Note that you may need to uninstall a previous version of ArcGIS if you already have an older version on your computer. Note that you must have the appropriate version of Microsoft .NET framework installed before you can install the ArcGIS software (a link is provided to the version you need). Before clicking on any of the download links, continue reading step 6 below. 6. In step 2 of Esri’s instructions shown above, you are instructed to download the software. For this class, download both ArcGIS for Desktop and also ArcGIS Pro. It is helpful to download the ArcGIS Tutorial Data for Desktop as well, but the tutorial data takes up a lot of disk space, and if you are short on disk space, you can treat the tutorial data as optional. For this class, you do not need to download any of the other listed packages. Here is what the list of downloadable software packages looks like. 7. Install ArcGIS for Desktop first, and then install ArcGIS Pro. 8. If you are having trouble downloading, installing, or activating your copy of ArcGIS, please contact Esri support directly. Do not contact your school's IT helpdesk. To make sure you get the appropriate help, tell Esri support that you are using a student evaluation license.